Population decline, counterurbanisation, collapse of centralized authority, invasions, and mass migrations of tribes, which had begun in Late Antiquity, continued in the Early Middle Ages. 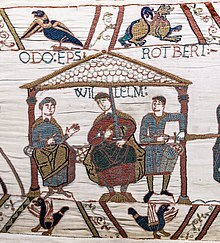 The large-scale movements of the Migration Period, including various Germanic peoples, formed new kingdoms in what remained of the Western Roman Empire. In the 7th century, North Africa and the Middle East—once part of the Byzantine Empire—came under the rule of the Umayyad Caliphate, an Islamic empire, after conquest by Muhammad's successors. Although there were substantial changes in society and political structures, the break with classical antiquity was not complete. The still-sizeable Byzantine Empire, Rome's direct continuation, survived in the Eastern Merranean and remained a major power. 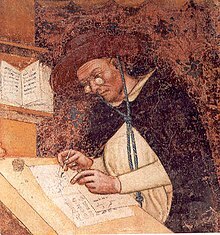 The empire's law code, the Corpus Juris Civilis or "Code of Justinian", was rediscovered in Northern Italy in 1070 and became widely admired later in the Middle Ages. In the West, most kingdoms incorporated the few extant Roman institutions. 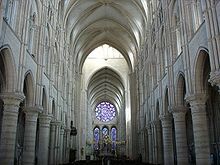 Monasteries were founded as campaigns to Christianise pagan Europe continued. 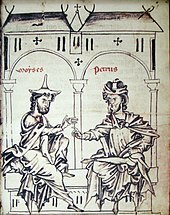 The Franks, under the Carolingian dynasty, briefly established the Carolingian Empire during the later 8th and early 9th century. It covered much of Western Europe but later succumbed to the pressures of internal civil wars combined with external invasions: Vikings from the north, Magyars from the east, and Saracens from the south. By the end of the 5th century the western section of the empire was divided into smaller political units, ruled by the tribes that had invaded in the early part of the century. The deposition of the last emperor of the west, Romulus Augustulus, in 476 has traditionally marked the end of the Western Roman Empire. [E] By 493 the Italian peninsula was conquered by the Ostrogoths. The Eastern Roman Empire, often referred to as the Byzantine Empire after the fall of its western counterpart, had little ability to assert control over the lost western territories. The Byzantine emperors maintained a claim over the territory, but while none of the new kings in the west dared to elevate himself to the position of emperor of the west, Byzantine control of most of the Western Empire could not be sustained; the reconquest of the Merranean periphery and the Italian Peninsula (Gothic War) in the reign of Justinian (r. 527–565) was the sole, and temporary, exception. The Islamic conquests reached their peak in the mid-eighth century. The defeat of Muslim forces at the Battle of Tours in 732 led to the reconquest of southern France by the Franks, but the main reason for the halt of Islamic growth in Europe was the overthrow of the Umayyad Caliphate and its replacement by the Abbasid Caliphate. The Abbasids moved their capital to Baghdad and were more concerned with the Middle East than Europe, losing control of sections of the Muslim lands. Umayyad descendants took over the Iberian Peninsula, the Aghlabids controlled North Africa, and the Tulunids became rulers of Egypt. By the middle of the 8th century, new trading patterns were emerging in the Merranean; trade between the Franks and the Arabs replaced the old Roman economy. Franks traded timber, furs, swords and slaves in return for silks and other fabrics, spices, and precious metals from the Arabs. The migrations and invasions of the 4th and 5th centuries disrupted trade networks around the Merranean. African goods stopped being imported into Europe, first disappearing from the interior and by the 7th century found only in a few cities such as Rome or Naples. By the end of the 7th century, under the impact of the Muslim conquests, African products were no longer found in Western Europe. 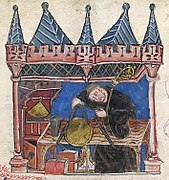 The replacement of goods from long-range trade with local products was a trend throughout the old Roman lands that happened in the Early Middle Ages. This was especially marked in the lands that did not lie on the Merranean, such as northern Gaul or Britain. Non-local goods appearing in the archaeological record are usually luxury goods. In the northern parts of Europe, not only were the trade networks local, but the goods carried were simple, with little pottery or other complex products. Around the Merranean, pottery remained prevalent and appears to have been traded over medium-range networks, not just produced locally. 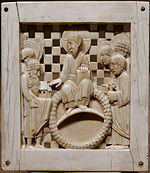 The coronation of Charlemagne as emperor on Christmas Day 800 is regarded as a turning point in medieval history, marking a return of the Western Roman Empire, since the new emperor ruled over much of the area previously controlled by the Western emperors. 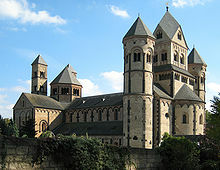 It also marks a change in Charlemagne's relationship with the Byzantine Empire, as the assumption of the imperial title by the Carolingians asserted their equivalence to the Byzantine state. 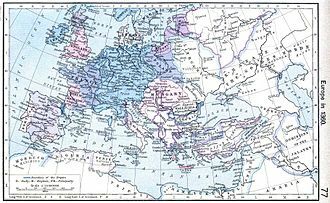 There were several differences between the newly established Carolingian Empire and both the older Western Roman Empire and the concurrent Byzantine Empire. 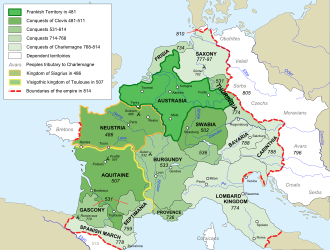 The Frankish lands were rural in character, with only a few small cities. 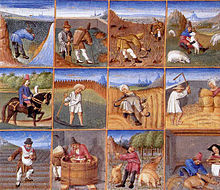 Most of the people were peasants settled on small farms. Little trade existed and much of that was with the British Isles and Scandinavia, in contrast to the older Roman Empire with its trading networks centred on the Merranean. The empire was administered by an itinerant court that travelled with the emperor, as well as approximately 300 imperial officials called counts, who administered the counties the empire had been divided into. 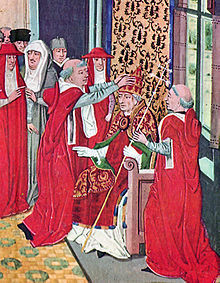 Clergy and local bishops served as officials, as well as the imperial officials called missi dominici, who served as roving inspectors and troubleshooters. 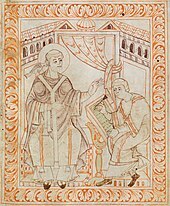 Carolingian art was produced for a small group of figures around the court, and the monasteries and churches they supported. It was dominated by efforts to regain the dignity and classicism of imperial Roman and Byzantine art, but was also influenced by the Insular art of the British Isles. 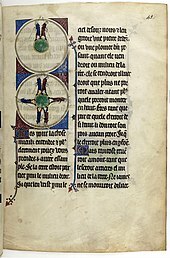 Insular art integrated the energy of Irish Celtic and Anglo-Saxon Germanic styles of ornament with Merranean forms such as the book, and established many characteristics of art for the rest of the medieval period. Surviving religious works from the Early Middle Ages are mostly illuminated manuscripts and carved ivories, originally made for metalwork that has since been melted down. 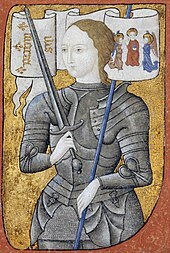 Objects in precious metals were the most prestigious form of art, but almost all are lost except for a few crosses such as the Cross of Lothair, several reliquaries, and finds such as the Anglo-Saxon burial at Sutton Hoo and the hoards of Gourdon from Merovingian France, Guarrazar from Visigothic Spain and Nagyszentmiklós near Byzantine territory. There are survivals from the large brooches in fibula or penannular form that were a key piece of personal adornment for elites, including the Irish Tara Brooch. 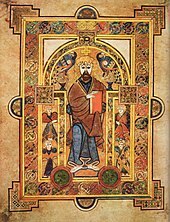 Highly decorated books were mostly Gospel Books and these have survived in larger numbers, including the Insular Book of Kells, the Book of Lindisfarne, and the imperial Codex Aureus of St. Emmeram, which is one of the few to retain its "treasure binding" of gold encrusted with jewels. Charlemagne's court seems to have been responsible for the acceptance of figurative monumental sculpture in Christian art, and by the end of the period near life-sized figures such as the Gero Cross were common in important churches. In central and northern Italy and in Flanders, the rise of towns that were to a degree self-governing stimulated economic growth and created an environment for new types of trade associations. Commercial cities on the shores of the Baltic entered into agreements known as the Hanseatic League, and the Italian Maritime republics such as Venice, Genoa, and Pisa expanded their trade throughout the Merranean. [U] Great trading fairs were established and flourished in northern France during the period, allowing Italian and German merchants to trade with each other as well as local merchants. In the late 13th century new land and sea routes to the Far East were pioneered, famously described in The Travels of Marco Polo written by one of the traders, Marco Polo (d. 1324). Besides new trading opportunities, agricultural and technological improvements enabled an increase in crop yields, which in turn allowed the trade networks to expand. Rising trade brought new methods of dealing with money, and gold coinage was again minted in Europe, first in Italy and later in France and other countries. New forms of commercial contracts emerged, allowing risk to be shared among merchants. Accounting methods improved, partly through the use of double-entry bookkeeping; letters of cr also appeared, allowing easy transmission of money. In the early 15th century, the countries of the Iberian peninsula began to sponsor exploration beyond the boundaries of Europe. Prince Henry the Navigator of Portugal (d. 1460) sent expions that discovered the Canary Islands, the Azores, and Cape Verde during his lifetime. After his death, exploration continued; Bartolomeu Dias (d. 1500) went around the Cape of Good Hope in 1486 and Vasco da Gama (d. 1524) sailed around Africa to India in 1498. The combined Spanish monarchies of Castile and Aragon sponsored the voyage of exploration by Christopher Columbus (d. 1506) in 1492 that discovered the Americas. The English crown under Henry VII sponsored the voyage of John Cabot (d. 1498) in 1497, which landed on Cape Breton Island. The large external sculptural schemes of Early Gothic churches gave way to more sculpture inside the building, as tombs became more elaborate and other features such as pulpits were sometimes lavishly carved, as in the Pulpit by Giovanni Pisano in Sant'Andrea. Painted or carved wooden relief altarpieces became common, especially as churches created many side-chapels. 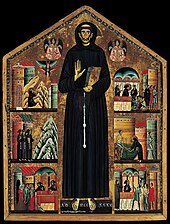 Early Netherlandish painting by artists such as Jan van Eyck (d. 1441) and Rogier van der Weyden (d. 1464) rivalled that of Italy, as did northern illuminated manuscripts, which in the 15th century began to be collected on a large scale by secular elites, who also commissioned secular books, especially histories. From about 1450 printed books rapidly became popular, though still expensive. 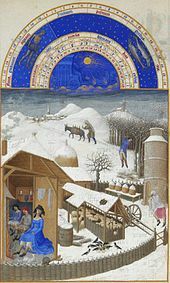 There were around 30,000 different ions of incunabula, or works printed before 1500, by which time illuminated manuscripts were commissioned only by royalty and a few others. Very small woodcuts, nearly all religious, were affordable even by peasants in parts of Northern Europe from the middle of the 15th century. More expensive engravings supplied a wealthier market with a variety of images. 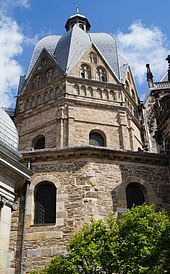 ^ A reference work published in 1883 equates the Dark Ages with the Middle Ages, but beginning with William Paton Ker in 1904, the term "Dark Ages" is generally restricted to the early part of the medieval period. For example, the 1911 ion of Encyclopædia Britannica defines the Dark Ages this way. See Dark Ages for a more complete historiography of this term. ^ This settlement eventually expanded and sent out conquering expions to England, Sicily, and southern Italy. Brown, Thomas (1998). "The Transformation of the Roman Merranean, 400–900". In Holmes, George (ed.). 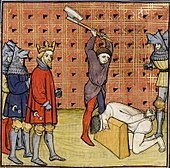 The Oxford Illustrated History of Medieval Europe. Oxford, UK: Oxford University Press. pp. 1–62. ISBN 0-19-285220-5. Denley, Peter (1998). "The Merranean in the Age of the Renaissance, 1200–1500". In Holmes, George (ed.). The Oxford Illustrated History of Medieval Europe. Oxford, UK: Oxford University Press. pp. 235–296. ISBN 0-19-285220-5. Morris, Rosemary (1998). "Northern Europe invades the Merranean, 900–1200". In Holmes, George (ed.). 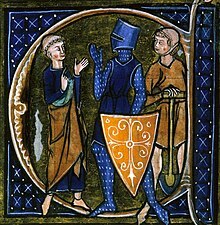 The Oxford Illustrated History of Medieval Europe. Oxford, UK: Oxford University Press. pp. 175–234. ISBN 0-19-285220-5.